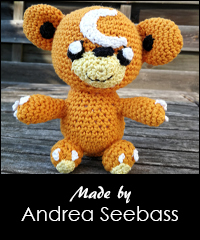 I made a pattern for Teddiursa in 2014, but I was never completely satisfied with the result. 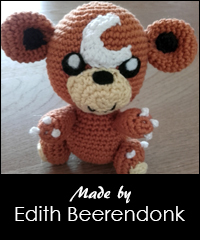 Now I made him again! This time I made the body smaller and the ears a bit bigger. I also adjusted the face and added templates for the eyes and nose to the pattern. The finished plush is about 11 cm high. Just LOVE your Pokemon patterns!! !